Legend has it that a hunter on his way home from an unsuccessful hunt was attacked by wild beasts. To escape, he climbed a tree. Hungry and sleepy, he plucked one leaf at a time from the tree in order to stay awake till dawn. By morning the predators had gone and the relieved hunter slithered down. 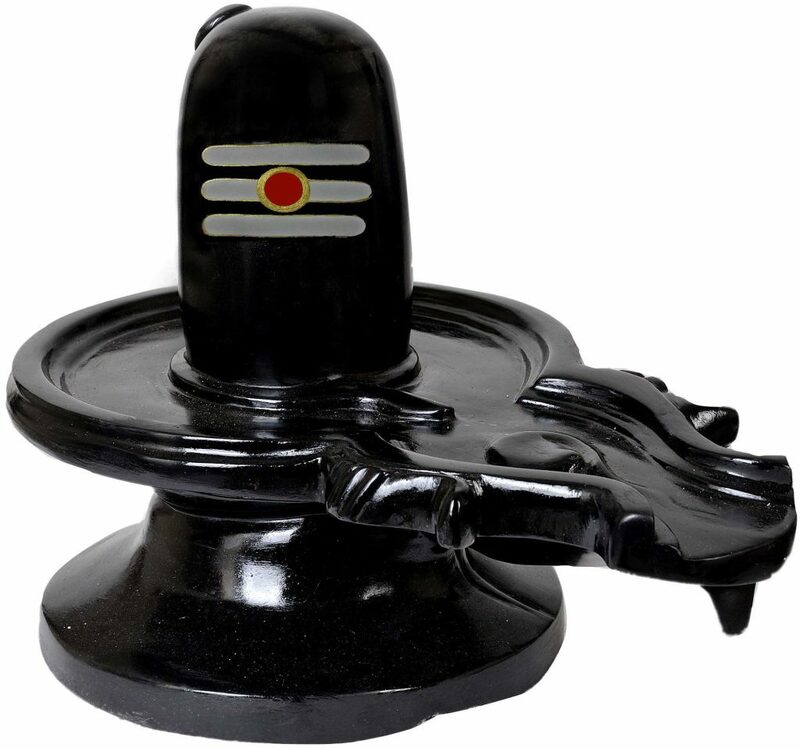 At the foot of the tree he discovered a lingam, a form in which Lord Shiva is worshipped. He also realised that the tree in which he had spent the night was a bilwa tree, which is sacred to Shiva. The hunter is said to have attained salvation as he had, knowingly or unknowingly, fasted the entire day, stayed awake the entire night and had performed puja, or worship, by showering bilwa leaves on Lord Shiva.Legend has it that a hunter on his way home from an unsuccessful hunt was attacked by wild beasts. To escape, he climbed a tree. Hungry and sleepy, he plucked one leaf at a time from the tree in order to stay awake till dawn. By morning the predators had gone and the relieved hunter slithered down. At the foot of the tree he discovered a lingam, a form in which Lord Shiva is worshipped. He also realised that the tree in which he had spent the night was a bilwa tree, which is sacred to Shiva. The hunter is said to have attained salvation as he had, knowingly or unknowingly, fasted the entire day, stayed awake the entire night and had performed puja, or worship, by showering bilwa leaves on Lord Shiva. Believing they will similarly gain the Lord’s grace, Hindus spend the day of Mahashivarathri (maha meaning ‘great’ or ‘big’, rathri meaning ‘night’) eating only fruit, and spend the night visiting Shiva temples and singing songs in praise of the Lord. With Brahma and Vishnu, Shiva is part of the Hindu Trinity or tri-murthi, the three forms that comprise the supreme deity. Where Brahma is the Creator God and Vishnu the Preserver, Shiva is the Destroyer, embodying the principle whereby everything in the universe inevitably declines and disintegrates. 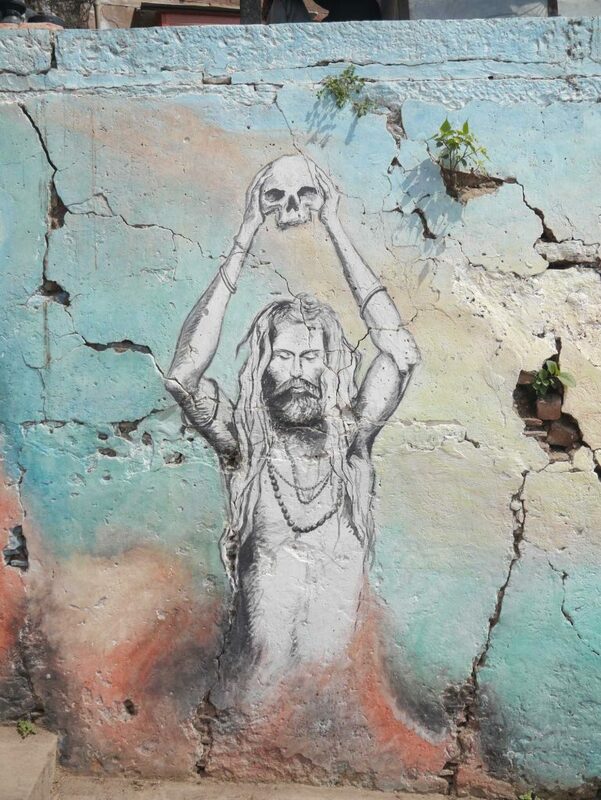 Yet it is from destruction that creation again rises, and so Shiva is both the end and the beginning. He is lord of death and the fount of life, and has two aspects – the fearful and the desirable. 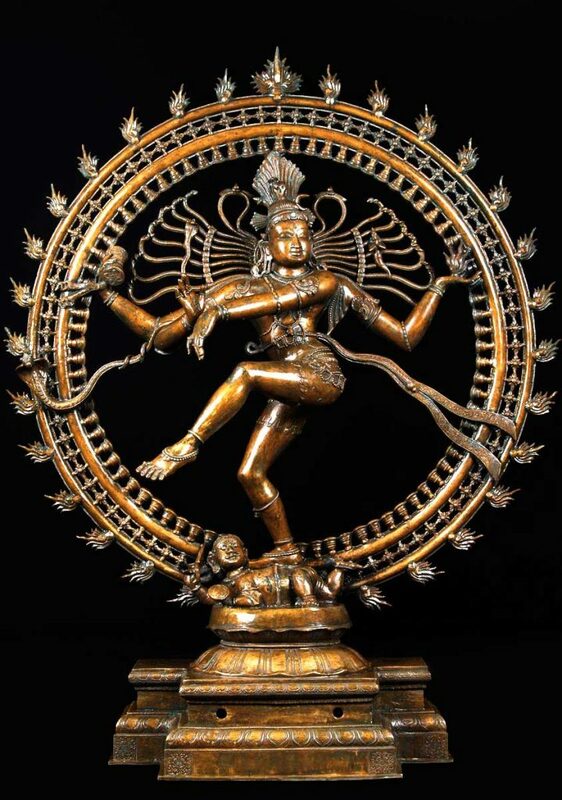 These two functions are apparent in the iconic representation of Shiva as Nataraja, the King of Dance. This is a depiction of the cosmic dance in which Shiva simultaneously destroys and creates the universe. He dances in ecstasy to the sound of the drum he holds in his upper right hand, which beats the rhythm of the cosmos, his hair flying wildly and his limbs and body caught in powerful movement. The cosmos springs into being, as represented by the ring encircling Shiva, but the flames that edge the circle symbolise its destruction. With his right foot, Shiva crushes the dwarf of ignorance and his lower right hand is held in a gesture of benediction, the abhaya mudra. 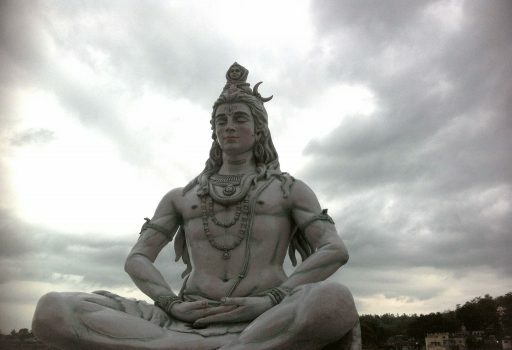 The symbolism associated with Shiva is considerable. To a Shaivite, a devotee of Shiva, the images of the deity are said to represent a visual sermon that expounds the religious philosophy embodied in the god. The trident he carries represents the three powers of knowledge, desire and implementation. The serpents around his neck signify the ego, which, once mastered, can be worn as an ornament. The Rudraksha beads denote purity and the mala or rosary Shiva holds in his right hand symbolises concentration. 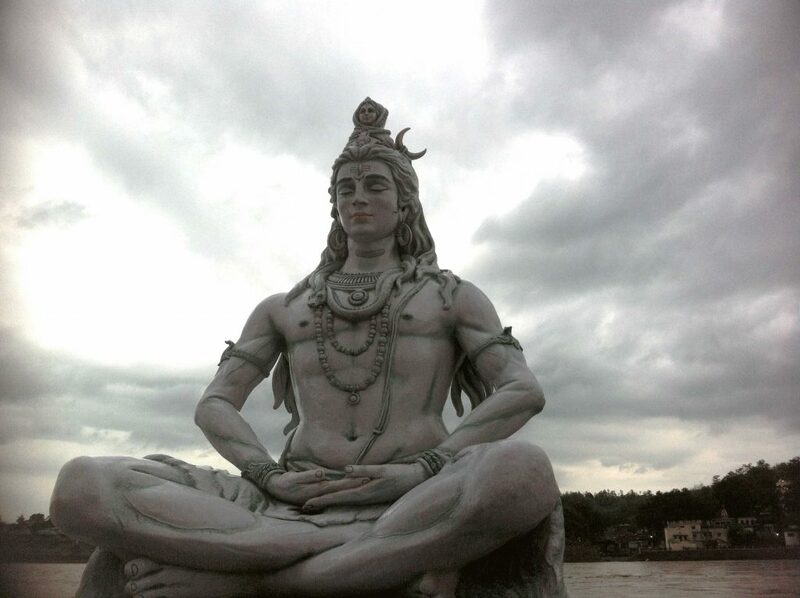 The Ganges, the holy river, is represented by the face on Shiva’s head, signifying the flow of scriptural teachings passing wisdom from one generation to the next, and also speaks of a legend in which Shiva tamed the turbulent force of the Ganges by trapping it in his hair. The moon on his forehead symbolises that the Lord is the master of time and is himself timeless. On his forehead is a large oval dot, the third eye of knowledge that, if opened, reduces to ashes the person in its vision, and the tiger skin worn by Shiva demonstrates that he is fearless. All these symbols identify Shiva as the Destroyer of evil and ignorance. On this day the devotee should take a vow to observe a fast after awakening in the morning and finishing his daily chores. He must observe a fast for the whole day and night. In the night he should worship me either in the temple or in his own home according to his convenience … While doing worship he should eulogise me and perform artis [a ceremony of light] in my praise. Devotees will perform rites of purification using milk or sacred water that came from a place of pilgrimage to chants of Om Namah Shivaya, the most important mantra in Shaivism meaning ‘Salutations to the auspicious one,’ and which draws the mind in upon itself to the presence of Lord Shiva. They may apply three horizontal lines of holy ash on their forehead emulating the Lord. This festival is not a holiday but an opportunity to practice the austerity and self-discipline that Hinduism encourages. It is a solemn event, whose focus is introspective and sets the devotee on a new and virtuous path. There are numerous temples connected with Shiva, and all celebrate Mahashivarathri with fervour. The twelve holiest Shiva temples are called the Jyotirlingas, where Shiva is worshipped in the divine form of the lingam, the giver of life. The lingam is bathed in holy water, milk and honey. Vermillion paste is applied to it with offerings of fruits and flowers. Perhaps the most sacred Jyotirlinga is the Kashi Vishwanath Temple in Varanasi, once known as Kasi, ‘the Resplendent City of Shiva’. Varanasi, the world’s oldest, continuously inhabited city, is believed to stand on the trident of Shiva. It is also considered to be the point where the holy river Ganges crosses the celestial Ganges or Milky Way and the subterranean underworld Ganges. Hindus are expected to make a pilgrimage to Varanasi at least once in their life and bathe in the river. Mahashivarathri holds immense importance in Varanasi, and all the temples are decorated for the occasion. The Kashi Vishwanath Temple is the main centre of religious activity during the festival, the finishing point for a marriage procession of Shiva that starts at the Mahamrityunjaya Temple. Other Shiva temples to visit during Mahashivarathri include the Neelkanth Temple, near Rishikesh, which, according to Hindu mythology, is the place where Shiva swallowed the poison; the temples of the city of Mandi in Himachal Pradesh where 200 deities are said to gather at the festival the city hosts at Mahashivarathri; and the Srisailam Temple in Andhra Pradesh, one of the twelve Jyotirlingas to which devotees trek from their homes and communities to offer prayers. The scenic Murudeshwar Temple near Mangalore on the west coast of India is home to a 60-foot statue of Lord Shiva, surrounded on three sides by the Arabian Sea. It is associated with one of the stories of the epic Ramayana and marks Mahashivarathri enthusiastically.